I was just sitting down to post on the Bar-Lock portable, as promised yesterday, when the typewriter heavens opened up yet again on this sunny winter's day - and in came four more typewriters. So I thought I’d do the same as yesterday and post images of the four additions and go into more detail later. First a reader came around with a lovely Lemair (Brother) Deluxe 1510. “What do you do with them all?” he asked, politely. I tried to explain about the Typosphere. 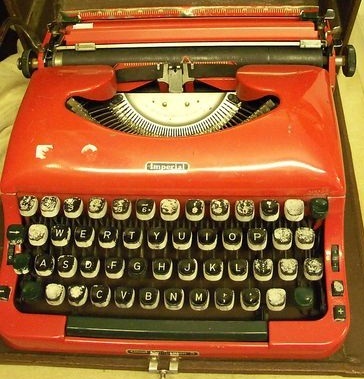 Since posting on Brother typewriters a month ago, I have now been able to list no less than 62 different varieties, with this being the latest one that is new to me. A few minutes later the post office delivery man turned up at my front doorstep with three parcels: the Alba A4 from France, an Imperial Good Companion Model 6, and a gorgeous bright red Royal Quite DeLuxe. To be honest, the Royal was already mine, but it was being returned in good shape from a photographer, who had borrowed it a while back. It was warmly welcomed home. I’m delighted with the Alba, yet another machine that Richard Polt tipped me off about. The Alba works beautifully, and came in a really neat case, very much like an old school case. Unfortunately, however, unlike Georg Sommeregger’s find in Switzerland last weekend, mine did not come with any Alba literature. Georg has been able to establish the Alba is an Antares product. But this is no tyoy typewriter. I have now acquired cream and metallic green Imperial Gold Companion models 6 and 7 in the past few weeks, as well as a green model 4, all in good condition. Will Davis posted on the IGC 6 in August 2010. The Davis Typewriter Works post is here. I notice there is a bright red IGC Model 5 for sale on British eBay for £55. This has the black tray under the keyboard and looks identical to the one - bought many years ago in New Zealand - that I gave Richard Amery in Sydney some time back. 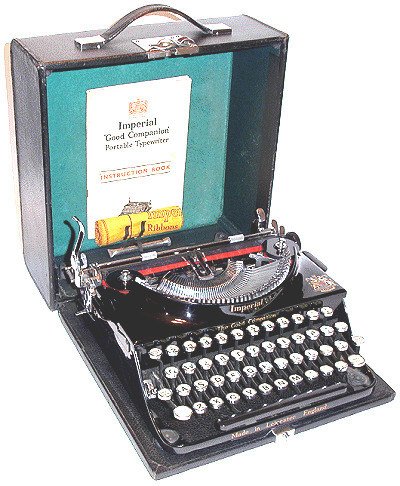 What is exceedingly good value on British eBay at the moment is a package of an Imperial Good Companion 1 and a British-assembled Remington Compact Portable, at a starting price of just 99 pence! What isn’t such good value is that someone over there is trying to sell Richard Milton’s IGC 1 for £41! I wonder if Richard knows? 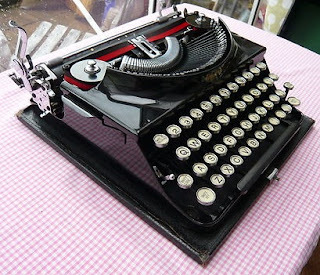 The actual typewriter for sale does not have the royal badge of approval from King George VI. It still looks in pretty good condition. I wonder why the seller doesn't highlight his or her own machine? Tomorrow: The “Underwood Imperial”. What will it turn out to be? the red royal is cool, depending on the configuration and numbers on the remington, even better. Very nice red Royal. 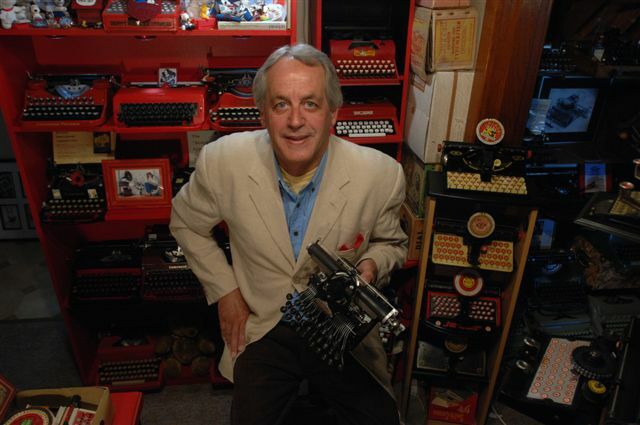 All of the typewriters are nice. More to add to my want list. That is "Quite Deluxe" for sure. I saw a Brother, a Royal Mercury label, in the bins the other day. Would love to try some IGC'S one day. I look forward to learning more about that Alba. I've seen that red IGC5 on eBay UK but have been scared off by vague mechanical problems they allude to. I think the GC without the Royal seal may be quite early. I think the Red Royal is going to become my 'Eleanor'.